In infants, rennin helps in digestion of milk. Pepsin is also present in their stomach. Why do infants need rennin for milk digestion, at the first place? Why does pepsin not act on the milk proteins in infants? Does the production quantity of rennin play a role in inhibiting the action of pepsin? Background: First of all, I must tell that your statement So why doesn't pepsin acts on the milk proteins? is based on wrong assumption that pepsin does not act on milk proteins. In general terms, it is said to be a coagulation of milk. It is important to coagulate milk so that milk doesn't pass on to intestine just like water. PS: the glycomacropeptide is a biologically active protein and has been shown to stimulate the release of cholecystokinin in the body2. EDIT: Adults too can digest casein with the sole help of pepsin. But pepsin requires lower pH for digesting casein, as low as pH 2.03. At pH higher than this (about 4.0 to 7.0), pepsin gives unusual peptides on digestion4. Infants have a higher pH than this, which makes pepsin incapable of digesting casein in their body5. This also, partly, explains why infants need chymosin for this purpose. 4. 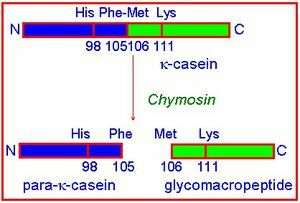 Ono T, Takagi Y, Kunishi I. Casein phosphopeptides release from casein micelles by successive digestion with pepsin and trypsin. Biosci Biotechnol Biochem. 1998;62:16–21. doi: 10.1271/bbb.62.16. 5. Dallas D. C.; Underwood M. A.; Zivkovic A. M.; German J. B. Digestion of protein in premature and term infants. J. Nutr. Disord. Ther. 2012, 21121–9. Milk contains a protein called caesin which gets digested in an adult body with the sole help of pepsin.But pepsin requires lower pH for digesting caesin. Since infants are basically fed on milk and they have a higher pH which makes pepsin incapable of digesting caesin in their body.Therefore infants need an enzyme named renin for this purpose. Not the answer you're looking for? Browse other questions tagged biochemistry proteins enzymes digestive-system or ask your own question. Why Do Ruminants Require A Multi-Compartment Stomach To Digest Food?